Stopping myself from buying things in Topshop is becoming even more difficult. Or rather buying things in general especially as I work in the city centre of York along the main highstreet so I have to walk past various shops on my way to and from work. With Topshop.. if I walk past it.. I have to go in.. If I go in.. I have to buy something.. SUCH a slippery slope! So to stop myself from being flat out broke all the time, Ive started only buying sale items, which is a start I guess.. I came accross these four items in the sale the other week and I couldn't be happier with my purchases! Luckily they had them in my size or I probably would have broken down in tears right there on the shop floor! 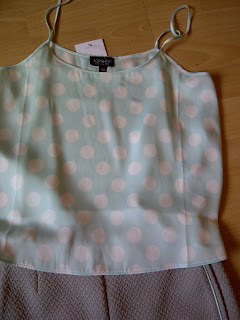 I bought this grey and mint green outfit for about £10! I never usually buy full outfits when I'm shopping as I'm never really in the frame of mind to think about what goes and what doesn't, but I was bored and had loads of time on my hands to I could actually look around properly. I saw the top immediately and when I realised it was in my size I decided I wanted it straight away. Its simple, it's lightweight and would be perfect for what I was expecting to be a hot (or at least warm) summer in the UK. 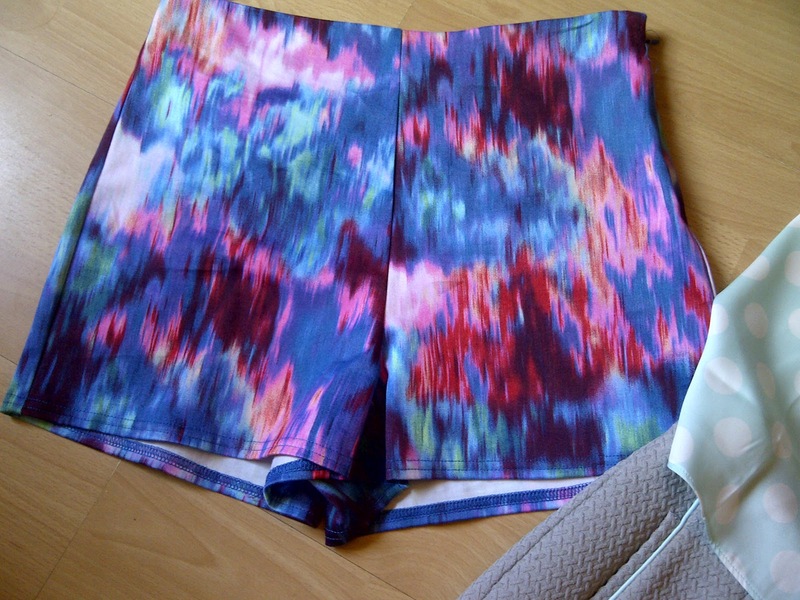 And then I came across these other shorts which I absolutely LOVE! I've worn them about 5 times already with a crop top or just a vest tucked in. They're very unlike what I'd usually wear (I'm more of a leggings and a top kind of girl) But I've recently decided that I want to expand my wardrobe with different styles and to be honest; a bit more colour! Most of my clothes were dark and boring with a few splashes of burgundy here and there but no real bright colours so I've started buying more coloured items. I really like these shorts but haven't had a chance to wear them yet as the weather hasn't been right. But as soon as it's sunny you'll see me out there parading round in these cute shorts. 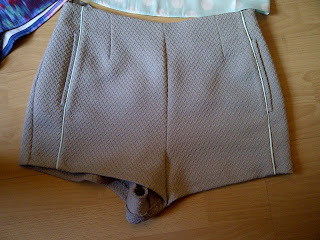 They're made of quite a thick material so you'll definately need to wear these tight-less and the mint green piping is a nice addition and adds the slightest bit of colour to an otherwise plain piece. I've been looking for some nice sandals for ages now and as I'm not a huge fan of feet I've never been too keen on getting mine out as much as this. But I tell you what... Walking to work in the mornings and walking home again has been a much more pleasant journey with these on. I wore UGGS the other day to work and my feet were so unbelievably hot and in this wet humid weather sandals really have been a god send! And at £7 I really couln't argue! I've also recently become quite the Glitter fan and have been painting my nails with various glitter nail varnished for a couple weeks now. 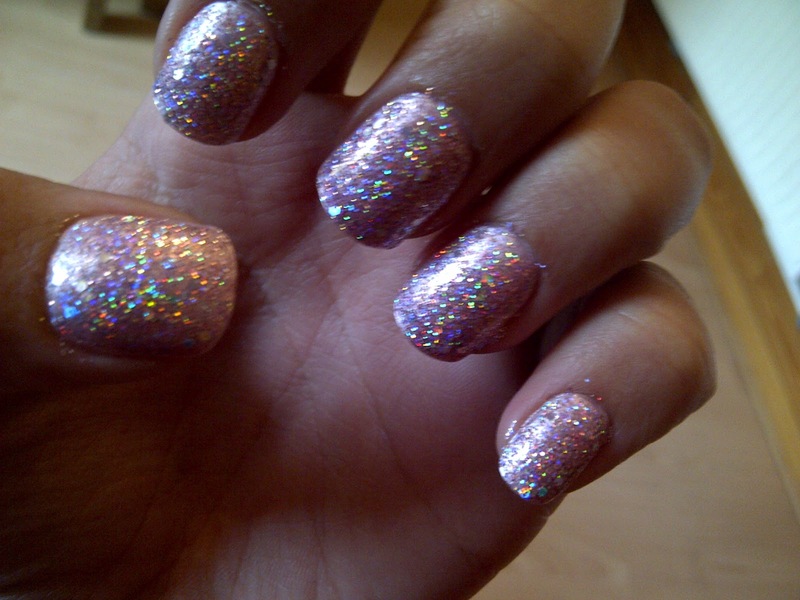 This has gone straight to the top of my favourites list though as it is such a nice colour and you can get the glitter to apply really thick or just a few sparkles here and there which is something I've found hard to do with O.P.I's glitter varnishes. When I had this Topshop one on, I had people comment daily on how they liked it. So this has my seal of approval! 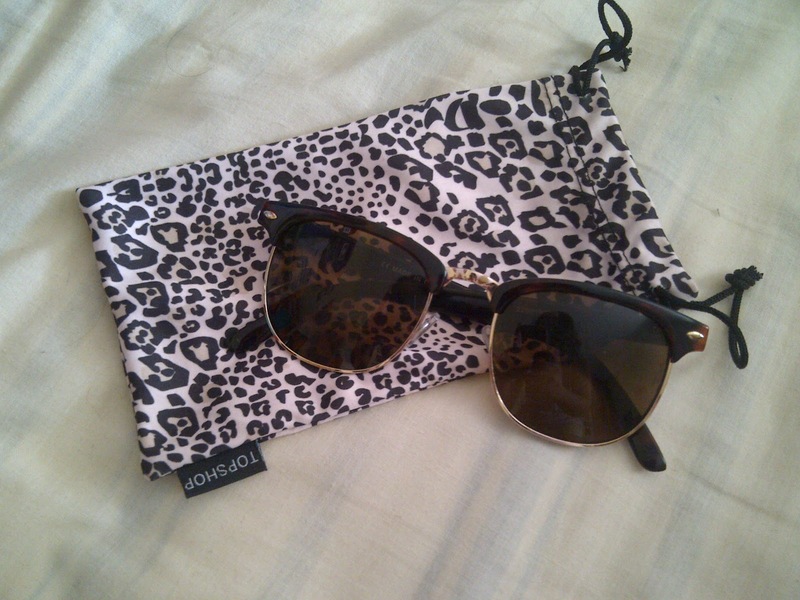 Finally I bought some sunglasses as I'd forgotten mine that day and I didn't want to be blinded on my way home so I got these cute ones for £8. I'm a huge fan of the Ray Ban styles; Aviator, Wayfarer etc but as I'm a humble student I haven't as of yet been able to save up to buy myself a real pair so I'm having to settle for look-a-likes for the time being but I really like how these look. 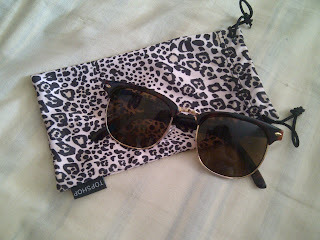 Luckily I have that shape face where I can pull off most sunglasses styles and shapes! All in all, I spent about £50 more or less.. which is a lot better than the £70/£80 I would have spent if they werent sale items! THANK GOD FOR STUDENT DISCOUNT! Thanks :) I found your university book post useful! I'm starting uni next month!